Moon Knight is a character who always has an excess of baggage to carry whenever a new title springs up around him. He’s one of the more blatant DC surrogates in the Marvel Universe, a situation made even more obvious after his creator, Doug Moench, went on to fame writing Batman. Originally, the hook of Moon Knight was “Crazy White Batman," but as the Dark Knight grew darker and edgier in the eighties and beyond, Moon Knight lost a lot of what differentiated them. His multiple personalities became an obstacle to storytelling rather than an innovation. The more recent titles by Gregg Hurwitz and Brian Michael Bendis ratcheted up the insanity to a psychotic level and added unnecessarily excessive violence on top of it. 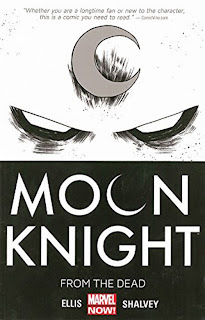 Warren Ellis used Moon Knight extensively in his Secret Avengers run and was given the opportunity to revamp the character as part of All-New Marvel NOW. His stories collected in Moon Knight Vol. 1: From the Dead quickly joined Daredevil and Hawkeye as part of Marvel’s pantheon of acclaimed solo hero titles. Ellis stripped Moon Knight back to the original concept and modified it brilliantly: instead of one superhero and three civilian identities, Marc Spector is now one man with three superhero personalities. Whether or not Moon Knight has any connection to the god Khonshu is both confirmed and side-stepped: Spector was resurrected and empowered by Khonshu, but what exactly Khonshu is remains unclear. Similarly, the psychiatrist who explains all this to him may not be on the up-and-up. The From the Dead trade collects six done-in-one stories just like Ellis’ stint on Secret Avengers. It begins with the already reformatted Moon Knight on the trail of a serial killer, introducing the first of the personalities: “Mr. Knight." This incarnation wears a completely white suit and mask, is driven around town in a remote-controlled limo, and has a detective-oriented mind. As per many of Ellis’ villains, the slasher turns out to be a perversion of technology; in this case, it’s a former SHIELD super-soldier in need of new bionic parts. In a bit of likely unintentional synergy, this issue came out just as Agents of SHIELD was making its resurgence and revealing that John Garrett had the same backstory. There’s a massive genre shift in issue #2 with Moon Knight taking on a very human sniper who was screwed over by his employers. Declan Shalvey’s panel work is especially outstanding in this issue. It’s in an eight-panel format, with each panel occupied by a character. These panels are slowly replaced with blank white as one by one, the sniper takes out his former colleagues. This issue also introduces the superhero personality of Moon Knight with a costume closer to his classic one with extra tactical armor pieces. Issue #3 was memorably solicited with “Moon Knight punches ghosts” as the only text to accompany the cover featuring the third persona: the magic armor. This issue is one of the very few times we see Spector out of his costume, and it’s for a good reason. Using a stockpile of Egyptian artifacts that he doesn’t even remember buying, Spector creates a mystical suit to fight the ghosts of disgruntled punk rockers. I happen to follow most of the creative team on social media and as Ellis explains it, one specific piece kept requiring modifications: the Giant F*cking Bird Skull, the crowning piece of the new era of Moon Knight suits. It’s not used again in the remainder of From the Dead, but it doesn’t need to be, as it feels like a sort of “super mode” to be used in only the most dire of circumstances. The weakest issue is the fourth, in which Moon Knight interacts with the dream world and alien spores. Jordie Bellaire’s colors here are gorgeous but it’s both too trippy and a little derivative of The Tell-Tale Heart. But after the fourth story’s dip, Moon Knight gets right back in gear with a 22-page homage to The Raid. This isn’t speculation: director Gareth Edwards’ name is a piece of prominent graffiti on the apartment building wherein the issue takes place. The sequence of Mr. Knight punching, kicking, eye-gouging and Mooncopter-summoning his way through a five-story building is there mostly for Declan Shalvey to show off. Like issue #2, it’s a story without a supernatural or technological twist. Moon Knight is there to rescue the kidnapped daughter of a gangster from normal thieves, but the stakes still feel high. The For the Dead trade closes with the introduction of a new version of Black Spectre. Hurwitz killed off Moon Knight’s nemesis in his previous run, and instead of resurrecting him, Warren Ellis constructed a new Black Spectre fit for the new paradigm. Ryan Trent is a cop tired of Moon Knight taking work and prestige away from him and his profession. This issue has a second purpose of reintroducing some of Moon Knight’s old supporting cast as Trent interviews Marlene Alraune and Jean-Paul "Frenchie" DuChamp to feed his obsession. This was a little treat for fans who were worried that Ellis had gone too far with his changes. I won’t spoil how their confrontation ends except to say that you won’t expect it. Marvel specifically asked Warren Ellis to turn Moon Knight into a viable property, and in Moon Knight Vol. 1: From the Dead, he and the art team succeeded beyond any expectations. The title and creators might possibly take home a few Eisners next year. I honestly wouldn’t be surprised if Moon Knight made the leap to the Marvel Cinematic Universe soon as well, either in a Phase IV film or on one of the Netflix TV shows. I’ve referred to this title as the best comic of the year in the solicits round-ups, and that designation stands at least as far as Marvel goes. Speaking of contenders for best comic, next week, it’s time for Transgiving yet again with a look the massive Dark Cybertron crossover.